I’ve been a fan of Plan Toys for awhile now. My boys had several of their toys as toddlers. I just love a brand that’s eco-friendly and uses sustainable materials in their products like Plan Toys does. Their toys are made out of from preservative-free rubberwood and they are one of the leading companies to create new material and process to minimize waste up to zero. Plus, who doesn’t love a toy that doesn’t make noise? Sometimes it’s nice to have something simple that doesn’t make sound and encourages imaginative play! For this review, I checked out the Chalet Dollhouse with Furniture. Just good old clean fun with this toy! There’s several rooms with furniture for the kids to move around and hours can be spent playing with this toy! Check out the Find a Store page to see what local store near you carries Plan Toys! Follow them on Twitter @PlanToys and on Facebook http://www.facebook.com/PlanToys. 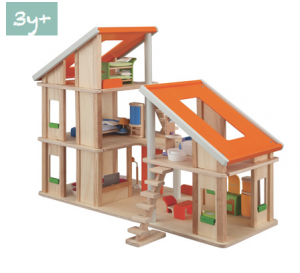 Disclaimer: I received a sample product of this dollhouse to facilitate this review. As always, all thoughts and opinions are my own.